Despite growing concerns over mercury (Hg) exposure to humans and wildlife on a global scale, little is known about Hg bioaccumulation in the New World tropics. From 2005 to 2011, we monitored Hg concentrations in blood of nine avian species occupying a geographic range of tropical wet broadleaf sites on the island of Hispaniola, including eight passerines (two Nearctic–Neotropical migrant and six resident species) and one top order predatory accipiter. Invertivorous songbirds were further differentiated by foraging guild, with six species of ground-foragers and two species of foliage-gleaners. Blood Hg concentrations were orders of magnitude higher in birds sampled in central and southern cloud forest sites (1,000–1,800 m elevation) than in northern and northeastern rainforest sites (50–500 m elevation), with migratory and resident species both showing 2–20× greater blood Hg concentrations in cloud forests than in rainforests. Within cloud forest sites, ground-foraging species had higher Hg concentrations than foliage-gleaning species. 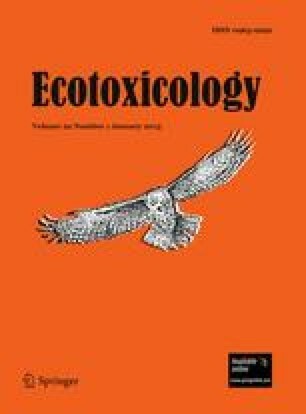 Top order predatory sharp-shinned hawks (Accipiter striatus) had the highest blood Hg concentrations among all species, suggesting that Hg biomagnification is occurring in terrestrial forests of Hispaniola. Two migrant songbird species overwintering on the island had higher blood Hg concentrations than have been recorded on their North American breeding grounds. Future studies should seek to elucidate sources of variation in atmospheric Hg deposition on Hispaniola and to quantify the dynamics of Hg cycling in tropical forest ecosystems, which may differ in important ways from patterns documented in temperate forest ecosystems. We gratefully acknowledge funding support from the American Ornithologists’ Union, the Association of Field Ornithologists, the Carolyn Foundation, the Eastern Bird Banding Association, the John D. and Catherine T. MacArthur Foundation, The Nature Conservancy, the Stewart Foundation, the Thomas Marshall Foundation, the U.S. Fish and Wildlife Service, the U.S. Forest Service Office of International Programs, the Wilson Ornithological Society, and friends of the Vermont Center for Ecostudies and the Vermont Institute of Natural Science. JMT was supported by a U.S. Environmental Protection Agency STAR Graduate Fellowship. Permission to band and collect blood samples from birds was provided by the U.S. Geological Survey Bird Banding Laboratory. Permission to conduct research and collect blood samples in the Dominican Republic was provided by the Subsecretaria de Áreas Protegidas y Biodiversidad. We thank M. Montesdeoca and E. Mason for excellent training and advice on laboratory methods. We are especially thankful to H. Almonte, J. Almonthe, J. Brocca, E. Cuevas, P. Diaz, S. Frey, E. Garrido, J. Hart, P. Johnson, J. Klavins, V. Mejia, R. Ortiz, and A. Townsend for their outstanding field work under difficult conditions. Constructive reviews of this manuscript were provided by two anonymous reviewers. John D. and Catherine T. MacArthur Foundation Grant #53450. U.S. Forest Service Office of International Programs Grant # MBP-BITH-20100427. USEPA STAR Fellowship #FP-91693701-1.